MUNICH — A large scale painting by Seventeenth Century Belgian artist Frans Snyders was the $336,000 top lot at Hampel Fine Art Auctions April 12 sale. The 67 by 94 ½ inch oil on canvas painting, titled “Bear Hunt,” featured a ferocious battle between a pack of hunting dogs and their ursine prey. 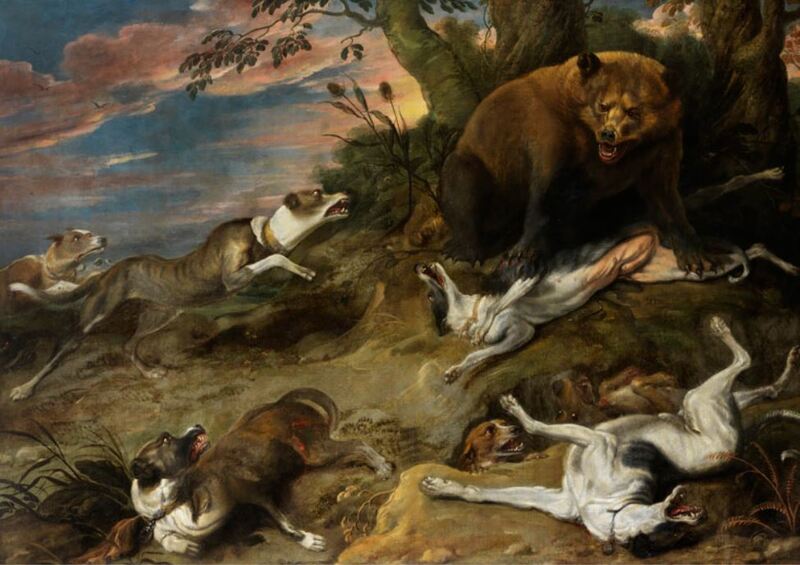 Seven dogs are seen in the painting, three of which have been visibly injured by the bear as others are still lunging into a battle that takes place on a hilltop before a setting sun. The painting had provenance to the Marquess of Remisa as well as Aureliano de Beruete y Moret, the director of the Prado Museum from 1918-1922. Watch for a full review in a future issue.